as you register/sign up. you have to enter email and username. Then it prompts you to check you email for varication. My work phone work today, my personal phone is still waiting. downloaded the app the other day. Still waiting to get an email confirmation to be verify. I was in Stoney Creek Mustangs wanted to use it. downloaded the app the other day. Still waiting to get an email confirmation to be verify. I was in Stoney Creek Mustangs want to use it. I wonder if a Heelo Coin is a good idea? As the world shifts toward a cashless economy, ICOs (Initial Coin Offerings) have emerged as a brand-new financing model, especially for start-ups. An ICO is intended to help those with limited resources raise funds for their new project or idea by releasing their own cyptocurrency tokens. These tokens attract optimistic investors in the global blockchain community who fund these start-ups by purchasing the tokens. Less than 1% of start-ups that opt for the traditional venture capital route actually receive funding. On the other hand, 90% of projects that are set to seed funds via ICOs reach their fundraising goals. ICOs are gaining popularity among the start-up community, largely due to more rapid funding and fewer regulations. Also, the process of running an ICO is less rigid and daunting than crowdfunding via traditional avenues. Start-ups don’t have to prove their ideas in the marketplace to obtain funds. The process is very simple: create a website, pre-announce the token sale, publish the terms in a white paper, and tell the story and vision of the project. That’s enough for investors! Since an ICO is an open and unregulated system, investors often worry about the ambiguity of utility tokens and significant risks, such as taxable proceeds. In order to popularize your token among crypto investors, you must prioritize the authenticity and transparency of your project. With many ICOs being established every day, you have to prove your legitimacy to your potential investors. You must clearly convey how your crypto token is expected to acquire more value as your project grows. Your ICO token needs transparent and identifiable goals and the ability to solve a particular problem. To educate you more on ICOs, we decided to share a great resource for anyone looking into this revolutionary financing model. The infographic from BTXchange you’ll also find below shares the history and evolution of ICOs, the latest trends, the positives and negatives behind ICOs, and much more to help you decide if an ICO is the right avenue for you. Very strong growth in beacons predicted for Europe. 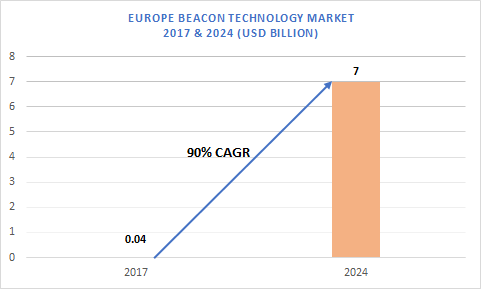 Europe Beacon Technology Market predicted to cross USD 7 billion by 2024 due to the growing popularity of beacons in tourist destinations and transport networks to assist visitors with location-based services. Interesting, a mobile app for taxis? Lyft (LYFT) has increased its expected IPO share price range to between $70 and $72 per share (from $62-$68), raising up to $2.22B and valuing the ride-hailing company at around $20B. The firm is set to price its shares today and will begin trading publicly on the Nasdaq on Friday. While still not profitable, Lyft claimed 39% of the U.S. market at the end of 2018, up 17 percentage points over two years. You probably have heard of the ground swell called 'Tech Backlash', people are fed up with data breaches and compromised personal data. The global tech-lash is growing. Heelo uses the best security on all platforms, but more important - Heelo collects no personal data, so nothing to hack or be compromised. This differentiates Heelo from all the other big tech. Spread the word, users should not be concerned with downloading the Heelo app and it is so quick and easy because they do not have to submit any personal data, just an email to verify signup. I am going to post this around here and there about once a month. Junglist, yes it is easy for me to see the change to mobile on Seeking Alpha. As of now my marijuana article has 3,039 views on computer screens and 18,520 mobile views, so about 5 to 1. 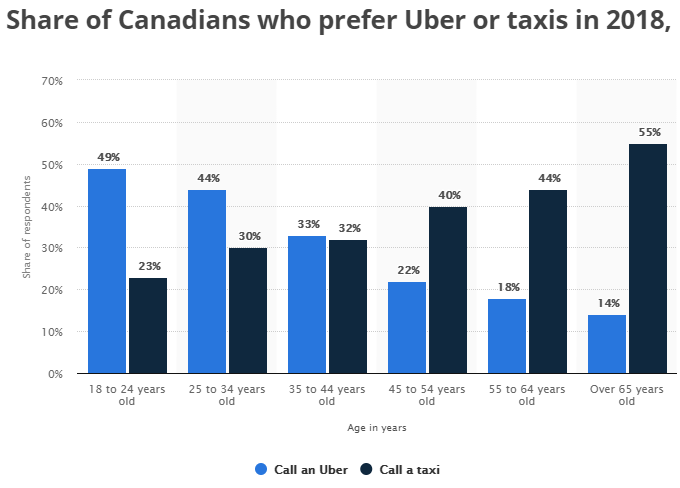 Here is another interesting graph on Uber, that shows younger people or millennials are the largest user group, older people still calling taxis. "As an example, when I wrote articles on Seeking Alpha about a year ago, half the views were computer and half mobile. Several months ago it was about 1/3 computer and 2/3 mobile. The one I did just last week was 4/5ths mobile views. The adoption to mobile is moving very quickly. A lot of companies and retailers will adopt Heelo just to try and survive."